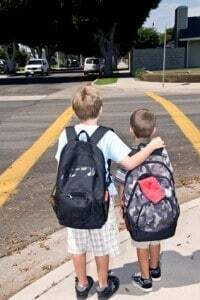 Pedestrians rely on crosswalks to give them safe passage across streets, expecting that drivers will respect the white lines that give them a path from curb to curb. The law is almost always on a pedestrian’s side when it comes to traffic accidents involving motor vehicles hitting a pedestrian, especially when the person on foot had the common sense to use the designated crosswalk. Yet regardless of the law, thousands of pedestrians are killed every year and even larger numbers are injured, many within those magic white lines. Rosenfeld Injury Lawyers LLC helps people injured in Chicago crosswalk accidents get compensation for their injuries. Our lawyers are dedicated to your success and only charge a fee when we recover compensation for you from a driver or party responsible for your accident. We offer free cases reviews and our lawyers are happy to meet with you at our office or your home. When traffic controls are not working or in place, drivers must yield for pedestrians when they are in a crosswalk on their side or lane of the roadway or approaching it. Vehicles may not pass another vehicle that is stopped for a pedestrian in a crosswalk. Whenever there are stop signs, flashing red signals or a clearly marked crosswalk, vehicles should yield right-of-way to pedestrians crossing (as set forth in Section 11-904). Although pedestrians are protected by the law in a crosswalk, this does not prevent or stop injuries. In 2011, there were 4,432 pedestrians killed in the U.S in traffic accidents. The National Highway Traffic Safety Administration also reported another 69,000 pedestrians that were injured, with over 13,000 of these injuries happening at intersections. A vehicle weighing several tons or more hitting a person with no protection at all can result in severe injuries that can change their life forever. Broken bones, spinal injuries, brain trauma and many other serious injuries have plagued these victims of crosswalk accidents. When a person is hit by a car and injured in a crosswalk, the most common recourse will be to file a claim with the driver’s insurance company. Since these accidents often cause serious injuries, the medical costs, lost income and other costs can be substantial. There may be long term costs as well for medical treatments, therapy and other expenses. It is important that crosswalk accident victims have a personal injury lawyer on their side to ensure that they receive adequate and fair compensation to cover all their expenses. In circumstances where the driver flees as in a hit-and-run accident or does not have adequate insurance to cover all the damages, an experienced car accident lawyer can help victims pursue claims against their own insurance company for uninsured or under-insured motorist claims. Chicago’s Rosenfeld Injury Lawyers LLC regularly represents pedestrians injured in accidents throughout the city of Chicago and suburbs. Before you discuss your case with an insurance company, we encourage you to talk with our office where we can discuss your situation including your injuries and legal options without any cost or obligation on your end. Contact us today!